英文摘要：From November 2011 to March 2013, 40 infrared cameras were installed in Hetaoping area, Wolong National Nature Reserve, Sichuan province. The species composition and relative richness were studied in this area. Of particularly concern, we analyzed that circadian activity rhythm, seasonal activity pattern and the influence of habitat types on the occurred frequency for the first 4 species including sambar (Cervus unicolor), giant panda (Ailuropoda melanoleuca), red panda (Ailurus fulgens), golden monkey (Rhinopithecus roxellanae). We found that the results of daily activity pattern of this 4 species by cameras monitoring were almost consistent with previous studies. In winter, there were higher occurred frequency of giant panda and red panda in valley-stream, while sambar and golden snub-nose monkey had not exhibited particularly preference to valley-stream, this indicated that comparing to sambar and golden snub-nose monkey, giant panda and red panda more rely on permanent water source sites during winter. To help improve efficiency of application of infrared cameras in wildlife behavioral and conservation studies, researchers should set up camera traps based on special studied objective. 韩宗先, 胡锦矗, 杨建东. 2006. 小熊猫夏秋季的昼夜活动节律[J]. 四川动物, 25(3):597-602. 何佰锁, 袁朝晖, 张希明, 等. 2009. 红外线触发数码相机陷阱技术在大熊猫监测中的应用[J]. 西北大学学报:自然科学网络版, 7(2):1-5. 黄祥云, 胡德夫, 刘伟石, 等. 2003. 宜黄自然保护区华南虎野生种群调查及栖息评价[J]. 北京林业大学学报, 25(4):54-58. 李志兴. 2004. 珲春再现东北虎[J]. 野生动物, 25(2):34. 刘芳, 李迪强, 吴记贵. 2012.利用红外相机调查北京松山国家级自然保护区的野生动物物种[J]. 生态学报, 32(3):730-739. 卢学理, 蒋志刚, 唐继荣, 等. 2005.自动感应照相系统在大熊猫以及同域分布的野生动物研究中的应用[J]. 动物学报, 51(3):495-500. 吕九全, 李保国. 2006. 秦岭川金丝猴的昼间活动时间分配[J]. 兽类学报, 26(1):26-32. 马鸣, 徐峰, Chundawat RS, 等. 2006.利用自动照相术获得天山雪豹拍摄率与个体数量[J]. 动物学报, 52(4):788-793. 马世来, 何理来. 1996. 自动感应照相系统在野生动物调查中的应用[J]. 动物学研究, 17(4):360-370. 史东仇, 李贵辉, 胡铁卿.1982. 金丝猴生态的初步研究[J]. 动物学研究, 3(2):105-110. 武鹏峰, 刘雪华, 蔡琼, 等. 2012. 红外相机技术在陕西观音山自然保护区兽类监测研究中的应用[J]. 兽类学报, 32(1):67-71. 余志伟, 邓其祥, 胡锦矗, 等.1983. 卧龙自然保护区的脊椎动物[J]. 西华师范大学学报:自然科学版, 1:6-56. 张晋东, 黄金燕, 周世强, 等. 2011. 大熊猫取食竹笋期间的昼夜活动节律和强度[J]. 生态学报, 31(10):2655-2661. Carter NH, Shrestha BK, Karki JB, et al. 2012. Coexistence between wildlife and humans at fine spatial scales[J]. Proceedings of the National Academy of Sciences, 109(38):15360-15365. Efford MG. 2011. Estimation of population density by spatially explicit capture-recapture analysis of data from area searches[J]. Ecology, 92(12):2202-2207. Gysel LW, Davis EM. 1956. A simple automatic photographic unit for wildlife research[J]. Journal of Wildlife Management, 20:451-453. Heilbrun RD, Silvy NJ, Peterson MJ, et al. 2006. Estimating bobcat abundance using automatically triggered cameras[J]. Wildlife Society Bulletin, 34(1):69-73. Li S, Wang DJ, Gu XD, et al. 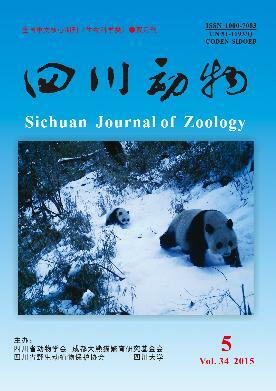 2010.Beyond pandas, the need for a standardized monitoring protocol for large mammals in Chinese nature reserves[J]. Biodiversity Conservation, 19(11):3195-3206. Liu X, Wu P, Songer M, et al. 2013. Monitoring wildlife abundance and diversity with infra-red camera traps in Guanyinshan Nature Reserve of Shaanxi Province, China[J]. Ecological Indicators, 33:121-128. Semiadi G, Muir P, Barry T, et al. 1993. Grazing patterns of sambar deer (Cervus unicolor) and red deer (Cervus elaphus) in captivity[J]. New Zealand Journal of Agricultural Research, 36(2):253-260. Swann DE, Hass CC, Dalton DC, et al. 2004. Infrared-triggered cameras for detecting wildlife:an evaluation and review[J]. Wildlife Society Bulletin, 32(2):357-365. Wong TS, Servheen CW, Ambu L. 2004. Home range, movement and activity patterns, and bedding sites of Malayan sun bears (Helarctos malayanus) in the rainforest of Borneo[J]. Biological Conservation, 119(2):169-181.